Let’s get started with Django! In this chapter, we’ll be giving you an overview of the how to get started with Django. You’ll be setting up a new project and a new web application. By the end of this chapter, you will have a simple Django-power webpage up and running! Let’s start by checking that your Python and Django installations are installed correctly, and are at the correct version for this tutorial. To do this, open a new terminal instance and issue the following command. This print the Python version number and exit. If the version displayed is anything but 2.7.5, you will need to go back to Section 3.2 and verify you have completed all the relevant steps for your operating system. After verifying your Python installation, check your Django installation by issuing the following command. The command again executes the code within the string provided as part of the -c switch. After importing Django, you should see 1.7 printed underneath. If you see a different set of numbers or are greeted with a Python ImportError, go back to Section 3.2 or consult the Django Documentation on Installing Django for more information. If you find that you have got a different version of Django, it is possible that you will come across problems at some point. It’s definitely worth making sure you have Django 1.7 installed. On Windows you may have to use the full path to the django-admin.py script. i.e. python c:\python27\scripts\django-admin.py startproject tango_with_django_project as suggested on StackOverflow. This command will invoke the django-admin.py script, which will set up a new Django project called tango_with_django_project for you. Typically, we append _project to the end of our Django project directories so we know exactly what they contain - but the naming convention is entirely up to you. a Python script called manage.py. wsgi.py, a Python script used to help run your development server and deploy your project to a production environment. The project configuration directory has been created with new Django projects since version 1.4. Having two directories with the same name may seem quite a bit odd, but the change was made to separate out project-related components from its individual applications. In the project directory, you will see there is a file called manage.py. We will be calling this script time and time again as we develop our project, as it provides you with a series of commands you can run to maintain your Django project. For example, manage.py allows you to run the built-in Django development server to test your work and run database commands. You’ll be using this script a lot throughout the development cycle. See the Django documentation for more details about the Admin and Manage scripts. You can try using the manage.py script now, by issuing the following command. #TODO(leifos): add description of migrate command: from django tutorial: The migrate command looks at the INSTALLED_APPS setting and creates any necessary database tables according to the database settings in your mysite/settings.py file and the database migrations shipped with the app (we’ll cover those later). You’ll see a message for each migration it applies. If you’re interested, run the command-line client for your database and type dt (PostgreSQL), SHOW TABLES; (MySQL), or .schema (SQLite) to display the tables Django created. Now open up your favourite web browser and enter the URL http://127.0.0.1:8000/ 1. You should see a webpage similar to the one shown in Figure 1. 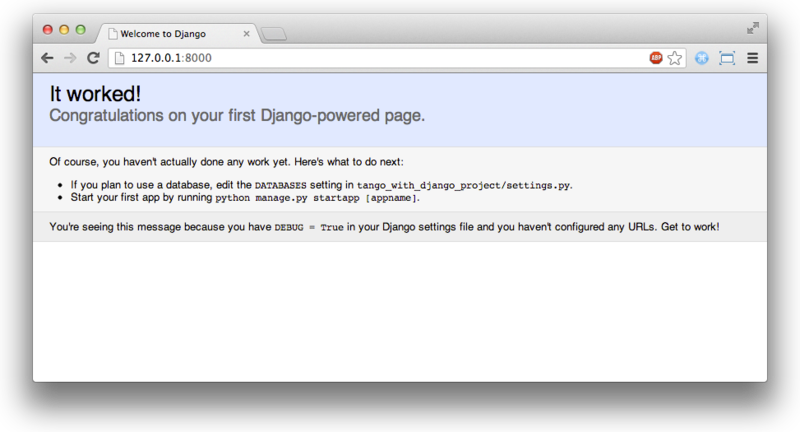 Figure 1: A screenshot of the initial Django page you will see when running the development server for the first time. Executing this command will force the development server to respond to incoming requests on TCP port 5555. You will need to replace <your_machines_ip_address> with your computer’s IP address. When setting ports, it is unlikely that you will be able to use TCP port 80 as this is traditionally reserved for HTTP traffic. Also, any port below 1024 is considered to be privileged by your operating system. While you won’t be using the lightweight development server to deploy your application, sometimes it is nice to be able to demo your application on a computer of a colleague. Running the server with your machine’s IP address will enable others to enter in http://<your_machines_ip_address>:<port>/ and view your web application. Of course, this will depend on how your network is configured. There may be proxy servers or firewalls in the way which would need to be configured before this would work. Check with the administrator of the network you are using if you can’t view the development server remotely. The django-admin.py and manage.py scripts provides a lot of useful, time-saving functionality for you. django-admin.py allows you to start new projects and apps, along with other commands. Within your project directory, manage.py allows you to perform administrative tasks within the scope of your project only. Simply execute the relevant script name without any arguments to see what you can do with each. The official Django documentation provides a detailed list and explanation of each possible command you can supply for both scripts. If you are using version control, now may be a good time to commit the changes you have made to your workspace. Refer to the crash course on GIT if you can’t remember the commands and steps involved in doing this. A Django application exists to perform a particular task. You need to create specific applications that are responsible for providing your site with particular kinds of functionality. For example, we could imagine that a project might consist of several applications including a polling app, a registration app, and a specific content related app. In another project, we may wish to re-use the polling and registration apps and use them with to dispatch different content. There are many Django applications you can download and use in your projects. Since we are getting started, we’ll kick off by walking through how to create your own application. To start, create a new application called Rango. From within your Django project directory (e.g. <workspace>/tango_with_django_project), run the following command. views.py, where you can store a series of functions that take a clients’s requests and return responses. views.py and models.py are the two files you will use for any given application, and form part of the main architectural design pattern employed by Django, i.e. the Model-View-Template pattern. You can check out the official Django documentation to see how models, views and templates relate to each other in more detail. Before you can get started with creating your own models and views, you must first tell your Django project about your new application’s existence. To do this, you need to modify the settings.py file, contained within your project’s configuration directory. Open the file and find the INSTALLED_APPS tuple. Add the rango application to the end of the tuple, which should then look like the following example. Verify that Django picked up your new application by running the development server again. If you can start the server without errors, your application was picked up and you will be ready to proceed to the next step. With our Rango application created, let’s now create a simple view. For our first view, let’s just send some simple text back to the client - we won’t concern ourselves about using models or templates just yet. In your favourite IDE, open the file views.py, located within your newly created rango application directory. Remove the comment # Create your views here. so that you now have a blank file. You can now add in the following code. Breaking down the three lines of code, we observe the following points about creating this simple view. We first import the HttpResponse object from the django.http module. Each view exists within the views.py file as a series of individual functions. In this instance, we only created one view - called index. Each view takes in at least one argument - a HttpRequest object, which also lives in the django.http module. Convention dictates that this is named request, but you can rename this to whatever you want if you so desire. Each view must return a HttpResponse object. A simple HttpResponse object takes a string parameter representing the content of the page we wish to send to the client requesting the view. With the view created, you’re only part of the way to allowing a user to access it. For a user to see your view, you must map a Uniform Resources Locator (URL) to the view. Within the rango application directory, we now need to create a new file called urls.py. The contents of the file will allow you to map URLs for your application (e.g. http://www.tangowithdjango.com/rango/) to specific views. Check out the simple urls.py file below. This code imports the relevant Django machinery that we use to create URL mappings. Importing the views module from rango also provides us with access to our simple view implemented previously, allowing us to reference the view in the URL mapping we will create. To create our mappings, we use a tuple. For Django to pick your mappings up, this tuple must be called urlpatterns. The urlpatterns tuple contains a series of calls to the django.conf.urls.url() function, with each call handling a unique mapping. In the code example above, we only use url() once, so we have therefore defined only one URL mapping. The first parameter we provide to the django.conf.urls.url() function is the regular expression ^$, which matches to an empty string. Any URL supplied by the user that matches this pattern means that the view views.index() would be invoked by Django. The view would be passed a HttpRequest object as a parameter, containing information about the user’s request to the server. We also make use of the optional parameter to the url() function, name, using the string 'index' as the associated value. You might be thinking that matching a blank URL is pretty pointless - what use would it serve? When the URL pattern matching takes place, only a portion of the original URL string is considered. This is because our Django project will first process the original URL string (i.e. http://www.tangowithdjango.com/rango/). Once this has been processed, it is removed, with the remained being passed for pattern matching. In this instance, there would be nothing left - so an empty string would match! The name parameter is optional to the django.conf.urls.url() function. This is provided by Django to allow you to distinguish one mapping from another. It is entirely plausible that two separate URL mappings expressions could end calling the same view. name allows you to differentiate between them - something which is useful for reverse URL matching. Check out the Official Django documentation on this topic for more information. You may have seen that within your project configuration directory a urls.py file already exists. Why make another? Technically, you can put all the URLs for your project’s applications within this file. However, this is considered bad practice as it increases coupling on your individual applications. A separate urls.py file for each application allows you to set URLs for individual applications. With minimal coupling, you can then join them up to your project’s master urls.py file later. This means we need to configure the urls.py of our project tango_with_django_project and connect up our main project with our Rango application. How do we do this? It’s quite simple. Open the project’s urls.py file which is located inside your project configuration directory. As a relative path from your workspace directory, this would be the file <workspace>/tango_with_django_project/tango_with_django_project/urls.py. Update the urlpatterns tuple as shown in the example below. url(r'^rango/', include('rango.urls')), # ADD THIS NEW TUPLE! The added mapping looks for url strings that match the patterns ^rango/. When a match is made the remainder of the url string is then passed onto and handled by rango.urls (which we have already configured). This is done with the help of the include() function from within django.conf.urls. Think of this as a chain that processors the URL string - as illustrated in Figure 2. In this chain, the domain is stripped out and the remainder of the url string (rango/) is passed on to tango_with_django project, where it finds a match and strips away rango/ leaving and empty string to be passed on to the application rango. Rango now tries to match the empty string, which it does, and this then dispatches the index() view that we created. 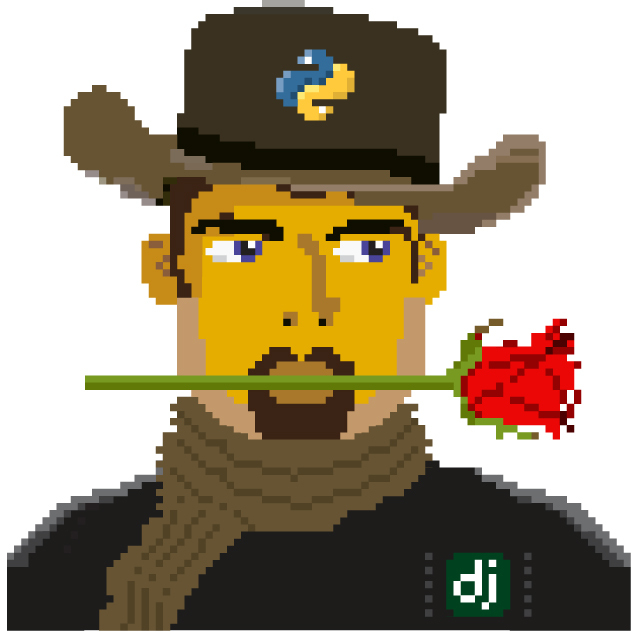 Restart the Django development server and visit http://127.0.0.1:8000/rango. If all went well, you should see the text Rango says hello world!. It should look just like the screenshot shown in Figure 3. Figure 2: An illustration of a URL, showing how the different parts of the URL are the responsibility of different url.py files. Figure 3: A screenshot of Google Chrome displaying our first Django-powered webpage. Hello, Rango! Within each application, you will create a number of URL to view mappings. This initial mapping is quite simple. As we progress, we will create more sophisticated mappings that using allow the URLs to be parameterised. It’s important to have a good understanding of how URLs are handled in Django. If you are still bit confused or would like to know more check out the official Django documentation on URLs for further details and further examples. The URL patterns use regular expressions to perform the matching. It is worthwhile familiarising yourself on how to use regular expressions in Python. The official Python documentation contains a useful guide on regular expressions , while regexcheatsheet.com provides a neat summary of regular expressions. What you’ve just learnt in this chapter can be succinctly summarised into a list of actions. Here, we provide these lists for the two distinct tasks you have performed. You can use this section for a quick reference if you need to remind yourself about particular actions. To create the project run, python django-admin.py startproject <name>, where <name> is the name of the project you wish to create. To create a new application run, $ python manage.py startapp <appname>, where <appname> is the name of the application you wish to create. Tell your Django project about the new application by adding it to the INSTALLED_APPS tuple in your project’s settings.py file. In your project urls.py file, add a mapping to the application. In your application’s directory, create a urls.py file to direct incoming URL strings to views. In your application’s view.py, create the required views ensuring that they return a HttpResponse object. Congratulations! You have got Rango up and running. This is a significant landmark in working with Django. Creating views and mapping URLs to views is the first step towards developing more complex and usable web applications. Now try the following exercises to reinforce what you’ve learnt. Revise the procedure and make sure you follow how the URLs are mapped to views. Now create a new view called about which returns the following: Rango says here is the about page. Now map the this view to /rango/about/. For this step, you’ll only need to edit the urls.py of the rango application. Revise the HttpResponse in the index view to include a link to the about page. In the HttpResponse in the about view include a link back to the main page. If you haven’t done so already, it is a good point to go off an complete part one of the official Django Tutorial. If you’re struggling to get the exercises done, the following hints will hopefully provide you with some inspiration on how to progress. Your index view should be updated to include a link to the about view. Keep it simple for now - something like Rango says: Hello world! <br/> <a href='/rango/about'>About</a> will suffice. We’ll be going back later to improve the presentation of these pages. The regular expression to match about/ is r'^about/' - this will be handy when thinking about your URL pattern. The HTML to link back to the index page is <a href="/rango/">Index</a>. The link uses the same structure as the link to the about page shown above. This assumes that you are using the IP address 127.0.0.1 and port 8000 when running your Django development web server. If you do not explicitly provide a port to run the development server on, Django defaults to port 8000 for you. There are many applications available out there that you can use in your project. Take a look at PyPI and Django Packages to search for reusable apps which you can drop into your projects.